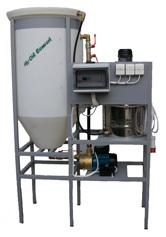 The OilConvert OC-220 processor is a complete automated system for converting vegetable olive (sun flower oil, corn oil etc. ) and especially used fried oils into Biodiesel for use in any internal combustion system, e.g. central heating, diesel cars, trucks, tractors and agriculture machinery, generators, buses etc). The system converts 200 liters of vegetable oil into 200 liters of Biodiesel in two hours. The systems process is based on the replacement of glycerin within the oil with methanol, using sodium hydroxide (NaOH) as a catalyst. This process lasts roughly two hours, during which no intervention is needed by the user. Before the process it is necessary to check the quality of the oil (titration), in order to determine the amount of Sodium Hydroxide need for the production of the Biodiesel. With the addition of a OC-206 resin filter, the Biodiesel produced reaches European specifications EN and ASTM. With the OilConvert OC-220 processor you will produce biodiesel at a cost lower than 25 Eurocents/liter, and at the same time you will be protecting the environment, with the reduction of sulphur pollutants and carbon dioxide into the air, you will be using a 100% recyclable source of energy, and you will be reducing the amount of disposable used vegetable oil currently responsible for polluting the soil. For further information and pricing please feel free to contact us.